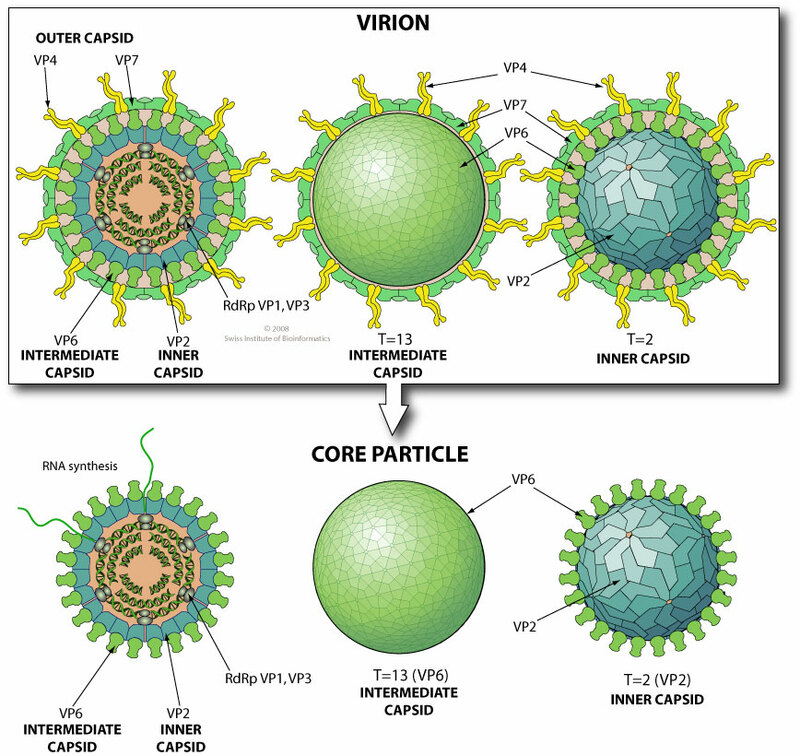 Non enveloped, icosahedral virion with a double capsid structure (except for cypoviruses and dinovernaviruses which have only the equivalent of the inner capsid). The outer capsid has a T=13 icosahedral symmetry, the inner capsid a T=2* icosahedral symmetry. Segmented linear dsRNA genome. Contains 10 to 12 segments coding for 10 to 14 proteins. Segments size range from 0.2 to 3.0 kb. Genome total size range from 18.2 to 30.5 kb. The dsRNA genome is never completely uncoated to prevent activation of antiviral state by the cell in response to dsRNA. Viral polymerase synthesizes mRNA from each of the dsRNA segments. These mRNAs are translocated to the cell cytoplasm where they are translated. Further proteins are produced by leaky scanning and protein processing. Attachement to host receptors probably mediates endocytosis of virus into host cell. Transcription from each of the dsRNA segments produces mRNA templates for translation. ASSOCIATED DISEASES Vertebrates: respiratory tract disease, gastroenteritis, myalgia. Bluetongue virus also mediates host cell apoptosis via caspases activaton (caspases-8, caspases-9, caspase-3, and caspase-7) . Avian orthoreovirus induces host cell apoptosis probably through upregulation of p53 (activation of DNA-damage signalling) by viral sigmaC protein . Avian orthoreovirus also seems to induces autophagy . NSP1 protein induces the proteasome-dependent degradation of IRF3, IRF5, and IRF7 to prevent their induction of IFN . NSP1 can also induce proteasome-dependent degradation of the ubiquitin ligase complex protein beta-TrCP, resulting in stabilization of IκB and repress NF-κB . .
Rotavirus can prevent STAT1 and STAT2 nuclear translocation . Avian orthoreovirus σA protein binds to dsRNA and inhibits the PRK-mediated antiviral response of the host cell . Mammalian orthoreoreovirus σ3 protein binds to dsRNA and inhibits the PRK-mediated antiviral response of the host cell . Mammalian orthoreovirus μ2; protein from strain Lang (T1L) inhibits IFN-beta-induced reporter gene expression . BTV NS4 might also be responsible for counteracting the antiviral response of the host . Rotavirus NSP3 protein evicts cytoplasmic poly(A) binding protein (PABP) from translation initiation complexes and thus “shuts off the translation of cellular polyadenylated mRNAs”":/by_protein/1579. Inhibition of host poly(A)-binding protein by virus -> Host translation shutoff .